Sensing what was coming, I briefly regretted bringing my bag that day. This was not what I had had in mind. I promised her I would look at it. I couldn’t tell her no. I thought of a great-grandmother, welcoming boy after boy, until the day she got the news that there would be a girl. I imagined her delight, picking up her pink yarn at last, and beginning a blanket for the long-awaited great-granddaughter that she would never see. So, I collected the afghan. When I got it, I discovered that it wasn’t half-finished – more like a third. 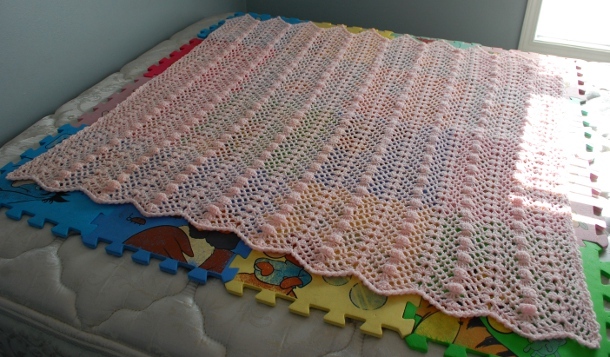 Grandma Daisy wasn’t doing this by halves and the afghan was huge, not the little baby blanket I was envisioning. Still, I read the directions and confirmed what my inspection of her work had told me. This was a simple pattern that I could easily follow, and there was no one else to do it. I agreed to finish it. I don’t often take on large projects. I prefer things that are small and quick, or at least have a variety of shaping to keep me interested. Only two months remained until baby Daisy was due, but I was convinced I could finish it quickly. I wasn’t counting on another curve-ball from Grandma Daisy. When I sat down with a hook and the directions to begin, I discovered that she wasn’t a “follow the pattern exactly” crocheter. Turns out, she was more of the “do what works for you as long as it looks right” variety. A skipped decrease here, an extra stitch there – I had to pitch the pattern and follow along the work that had been done to make my stitches match what had been done before. I’ve rarely felt so proud as I did the day I washed that finished blanket and pinned it out to dry, only a week before the due date. There were tears in all of our eyes the day that I returned Daisy’s afghan to her family. Baby Daisy’s mother had not known that her mother was secretly arranging for her grandmother’s afghan to be finished for her daughter. 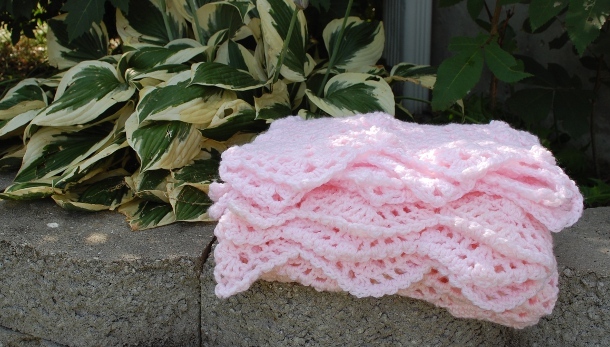 Four generations of women were connected through a lacy pink blanket, and I had been given an opportunity to form a special connection with a woman that I had never met by finishing her final project. What a heart touching story! You must be so proud! I know just making a gift that someone loves, perks me up, can just imagine how you feel! Congrats on a job well done. Very heart warming! What an honor to be a part of this project. I too would have regretted being asked to finish it. But how special! You must be a very kind person to take this on. You are a wonderful and talented person. So very nice to meet you. What a beautiful story – it gave me goose bumps!! !That family were so lucky to find someone like you who took on such a challenge. Congratulations! A lovely story and a really nice afghan. I love the way craft can connect to us our ancestors, both recent and ancient!!! Yes! This is a true testament to the joys of life! 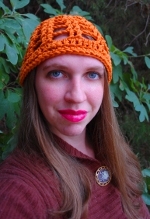 Crocheting being one that is close to my heart! I commend your ability to take on an others project and give their gift right when they couldn’t complete it! Kudos for the decision to take on the project, make it happen, and then even share it with the world and prove that love and compassion still exist in abundance! This and other recent blog posts I have found recently have made my entire year so much more enjoyable!!! Beautiful blanket…and beautiful workmanship! Any chance we can get the pattern? What a beautiful story, so go with a beautiful blanket. Now I just have to dry my (mostly)tears. Thanks for sharing!